Ali’s dad has spent all her life raging about monsters, things that none of the rest of the family have ever seen but that cause them all to be locked up safely in their rooms by the time the sun goes down. But then, on Ali’s 16th birthday, her little sister Emma has a dance recital, something they usually wouldn’t be allowed to go to. Yet Ali convinces her mum that they should go, who in turn convinces her dad. The night goes from the best to the worst in a matter of minutes and Ali loses everything. Following that night Ali comes to realise that the monsters her dad talked about are real, they are out there and if Ali wants to defeat them and avenge her family she will have to enrol the help of bad boy Cole Holland. I was looking forward to this book a lot before starting it, I’ll admit it was the cover and the title that really made me want to read it but the blurb sounded interesting too! I love the Zombie genre and this book did not disappoint in that respect. The story was really cool and quite original. I mean, the main character was avenging her family and stuff but the zombies were different from other zombies I’ve come across and I really liked the way that side of things developed. I liked the way they were spirits and the background to how they came about and stuff like that and also how scary they were sometimes!! There were two kinda sides fighting the zombies which have different ideas and I really enjoyed learning more about them and how Ali was going to take things after her family’s deaths. The character development was really quite good when it came to Ali and I loved that she really had balls when she needed them. The love story side of things didn’t really capture me all that well though I’m afraid. When it was introduced there was a love triangle thing going on that reminded me a lot of the Bella, Edward, Jacob thing in twilight and I wasn’t impressed. However once things progressed and the love triangle kinda broke down a bit I thought I would start enjoying it but the boy that Ali choose really annoyed me as he was so demanding and stubborn. He really treated Ali like crap in places and I hated it most the time. Other than the romance I really, really liked the story and especially the ending, in fact I would have marked better out of five if the romance hadn’t annoyed me so much. I’m afraid the I didn’t get a lot of the whole Alice in Wonderland thing. There were a few references to Alice in Wonderland in the chapter headings and a couple of bits like the white rabbit and stuff that Ali saw that referenced the classic but I think it has been that long since I read the original that I couldn’t see any other references or similarities if there were any. The characters were really quite well developed and I loved some of them, Kat was brilliant and I loved her and Ali’s relationship. The other girls were a bit annoying but they are 16 year old girls! haha. Coles gang were ok enough but I would have liked to get to know some of them better, Trina and Frosty were the best of the bunch but I did enjoy Bronx’ appearance. I also loved Ali’s grandparents and the way they tried so hard to be there for Ali and tried to get ‘down with the kids’ haha, it was so funny in places that I laughed out loud. 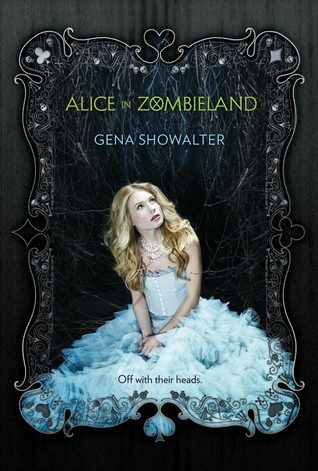 There were bits I didn’t love about Alice in Zombieland but I think if you are after a romance with a zombie twist then you will probably enjoy this one a lot. I know a lot of people will enjoy the romance more than I did and I don’t want to put anyone off but I don’t like guys bossing around their girlfriends and sending them mixed signals! Great review! The whole romance thing does sound a bit annoying and I already don’t like the guy Ali chose, but the rest sounds pretty good! I got kind of disappointed that there wasn’t much in the way of Alice in Wonderland. And I didn’t really enjoy the romance. Seems we thought the same things vaguely. Great review though!